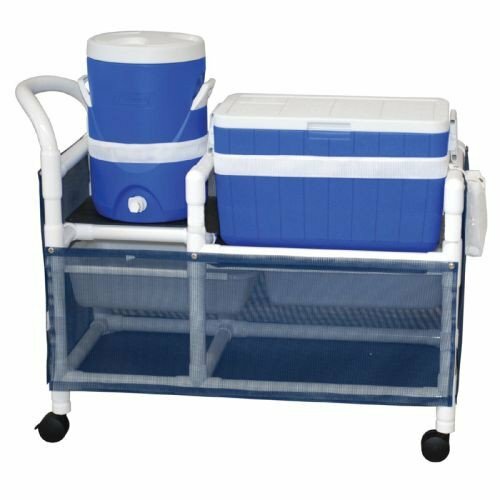 MJM PVC Ice Chest and Water Cooler Cart, by MJM International, comes with a 5 gallon water cooler and ice scoop. Constructed of healthcare grade polymer plastics with reinforced stress-related areas to provide stable weight bearing. PVC is less likely to experience growth of bacteria and fungi. MJM PVC Ice Chest and Water Cooler Cart features heavy duty threaded single wheeled casters for convenient mobility, and skirt cover panels to provide classier, less-exposed look. Cooler and ice chest colors may vary. Vitality Medical also carries other MJM International PVC Hospital Products such as the PVC Long Linen Cart with Two Shelves. Water Cooler and Ice Chest Color May Vary.